Since the sound quality of musical instruments depends on various factors, (e.g., materials, shape, the player's skill), the experience of the craftsman in the development of musical instruments is critical. All players seek musical instruments with good sound quality. It is therefore necessary to clarify scientifically the generation mechanism of sounds from musical instruments to establish a design method. In woodwind instruments such as flutes, bamboo flutes, recorders and so on, fluid-acoustic interactions consisting of vortices and resonance in a pipe occur . Many researchers have investigated these phenomena. Yoshikawa et al. measured the flow field around the exit of the windway and mouth by using Particle Image Velocimetry (PIV) and identified the acoustic sources based on the Howe vortex theory . Giordano  investigated the effects of the chamfers of the windway exit and the position of the edge with reference to the windway on the tonal sound using direct numerical simulations based on the Navier-Stokes equations, taking the ideal gas equation of state and assuming adiabatic conditions. However, the mechanism of the acoustic radiation and that of the generation of the vortices due to the acoustic feedback have not been clarified. Furthermore, the relationship between the pressure fluctuations of the standing wave in the pipe and the open-end corrections, which is used in the simple prediction of the acoustic resonant frequency of the pipe, has not been clarified. To clarify the above-mentioned phenomena, direct numerical simulations based on the compressible Navier-Stokes equations are performed for an actual recorder (Yamaha model YRA-28BIII) as shown in Figure 1. To validate the computational accuracy, the velocity field and sound pressure level are measured by PIV and microphone, respectively. 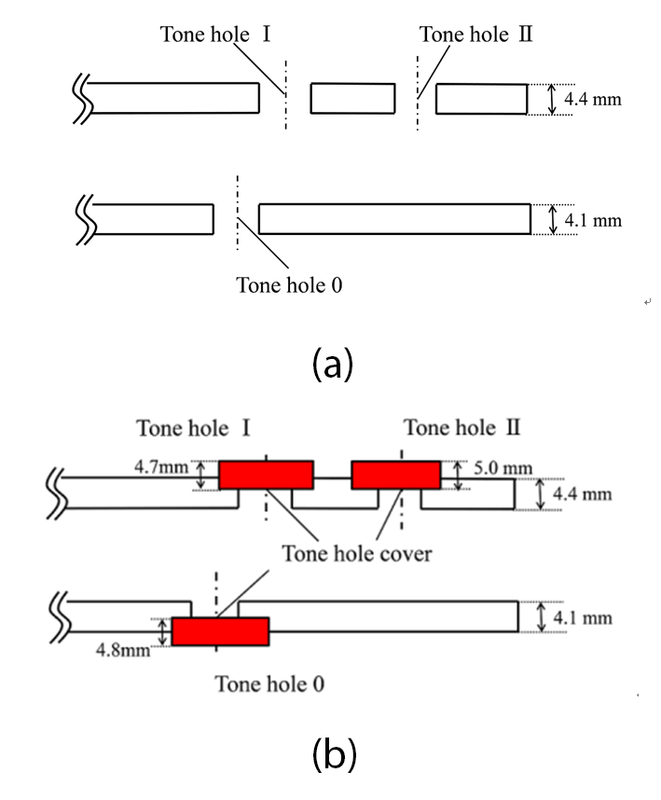 The flow and acoustic fields around a recorder were investigated using a short recorder with three tone holes as shown in Figure 1. In this paper, hereafter, this model is called “full model”. For PIV measurements, one of the models was divided along the plane of symmetry in the spanwise direction as shown in Figure 1(b). The tone hole names from this figure, “Tone hole 0”, “Tone hole I” and “Tone hole II” in turn from nearest to the mouthpiece to furthest will be used in the remainder of this article. Figure 2 shows a schematic of the recorder. The origin of the coordinate system is located at the center of the outlet of the windway in the vertical and spanwise directions for the full model. For the half model, the origin is set at the boundary between the model and the acrylic board. The streamwise direction in the windway is the x-axis, the vertical direction is the y-axis, and the spanwise direction intersection with those two axes is the z-axis. Figure 3 shows schematic of opening and closing the tone holes. Figure 1: Computational models of recorder (YRA-28BIII). (a) Full model. (b) Half model. Figure 2: Configurations of recorder. Figure 3: Opening and closing of tone holes. (a) open tone holes. (b) closed tone holes. Figure 4 shows the computational domain. The computational domain in the x-y cross-section is divided into three regions; a vortex region, a sound region and a buffer region, each having different grid spacings. The total computational domain includes approximately 8.2×107 grid points. The calculations for this study took two weeks using about 100 nodes of a supercomputer (FX10 in the Tokyo University or Kyushu University). Figure 4: Computational domain and boundary condition. The rectangular computational grid was generated using Pointwise, where grid density was adjusted based on the shape of the musical instrument. Pointwise was also employed to make the mask function X (x), where X (x) is 1 or 0 in object and flow regions, respectively. Toyohashi University of Technology's in-house code AADNS (Aeroacoustic Direct Numerical Simulation) imports Pointwise's unstructured tetrahedral cells and makes the above-mentioned mask function using the triangulated surfaces as the geometry, as shown in Figure 5. This surface grid was made using Pointwise based on the input CAD data (IGES format) of the musical instrument. Pointwise makes it easy to build the water tight geometry from CAD data and to specify where to generate the dense voxel elements. Figure 5: (a) Unstructured tetrahedral cells grid used for making mask function. (b) rectangular computational grid used in simulations. Figure 6(a) shows the fluctuation pressure, p', around the entire recorder. Figure 6(b) shows the fluctuation pressure and vorticity around the windway edge. Figure 6(c) shows the vorticity and the iso-surfaces of the second invariant of the velocity gradient as vertical structures. In these figures, T is the time period of the fundamental frequency. The origin of time, t = 0, is defined as when the fluctuation pressure became the maximum value on the center line of the resonator pipe. At t = 0, the two-dimensional vortex (Vortex 1) is formed in the free shear layer inclined downwards. Over time the shear layer moves downward and upward. Due to these movements, pressure fluctuations occur in the resonant pipe and propagate outward. Figure 6: Time variation of flow and acoustic fields (Umax = 13.7 m/s, open holes). (a) Contours of fluctuation pressure. (b) Contours of fluctuation pressure and vorticity. (c) Iso-surfaces of the second invariant of the velocity gradient and contours of vorticity. Images visualized with FieldView. 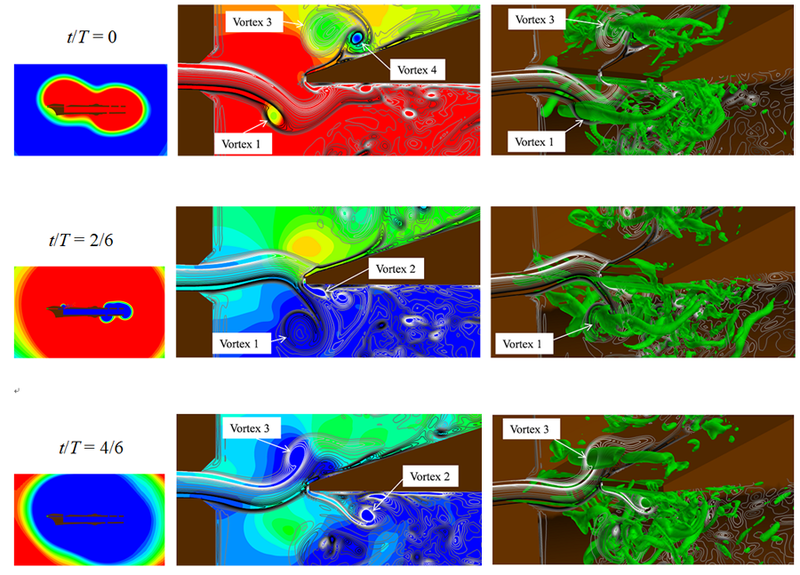 Direct aeroacoustic simulations for an actual recorder geometry were performed with three dimensional compressible Navier-Stokes equations. As a result, the generation mechanism of air-reed music instruments was clarified, including interaction between the flow and acoustic fields. The present study was supported by JSPS KAKENHI Grant of No. 24760134, that of No. 26820044 and through the Next-generation Supercomputer Strategy Program by the Ministry of Education, Culture, Sports, Science, and Technology of Japan (MEXT). The authors wish to acknowledge Hirofumi Onitsuka and Akira miki (YAMAHA Corporation), for their provision of experimental data and help in interpreting significance of this research. These results are included in the paper by Yokoyama et al.. 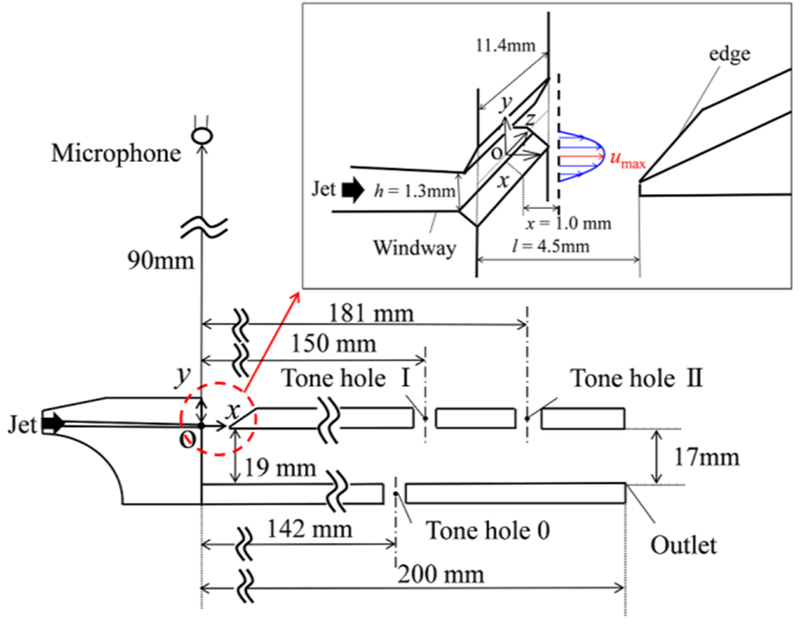 The first appearance of this article was “Direct numerical simulation of flow and acoustic fields around an air-reed instrument with tone hole” at Inter-noise 2014 by Yokoyama H, Kobayashi M, Onitsuka H, Miki A and Iida A.
 Benoit F, Joel G, Avraham H, Xavier P. Aeroacoustics of Musical Instruments. Annual Review of Fluid Mechanics. Vol.44; 2011. p. 1-25. Yoshikawa S, Tashiro H, Sakamoto Y. 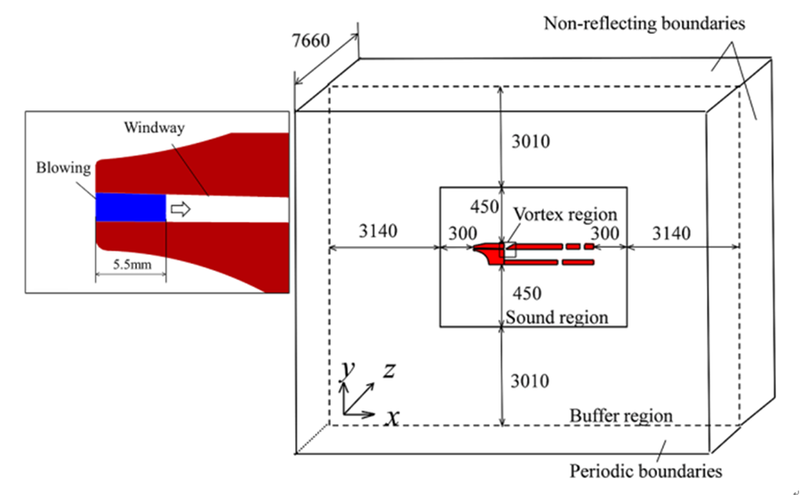 Experimental examination of vortex-sound generation in an organ pipe: A proposal of jet vortex-layer formation model. Journal of Sound and Vibration. Vol.331; 2012. p. 2558-2577. Howe M. S. Contributions to the theory of aerodynamic sound, with application to excess jet noise and the theory of the flue. Journal of Fluid Mechanics. Vol.71; 1975. p. 625-673. Giordano N. Simulation studies of a recorder in three dimensions. The Journal of the Acoustical Society of America, Vol. 135 (2); 2014. p. 906-916. Yokoyama H, Miki A, Onitsuka H, and Iida A, Direct numerical simulation of fluid-acoustic interactions in a recorder with tone holes, The Journal of the Acoustical Society of America, 2015 (in print).